Do you ever feel like God may not have been fully paying attention when he knit you together in your mother’s womb? For many years I wondered what my peers knew that I was clearly missing. As a child homework took me hours. God must have been multitasking when He made me I thought. Intelligent enough to do the work, with the blessing of many understanding teachers, I did graduate – I even went to college, and later graduate school. Even after school, there was a part of me that never felt like everyone else. As a working adult I often missed my deadlines and became the Queen of Excuses. Even today, my inability to always properly prioritize leaves me behind on my to-do list. This frustrating ‘chasing my tail’ behavior often left me feeling inadequate and even stupid. My friends seemed to have their acts together. They could balance motherhood, housework, paying bills, and having healthy meals on the table every day. I could barely manage to keep us in clean clothes, without shopping for new ones every week. Important things slipped through the cracks or more often were buried under my piles. One Thanksgiving, early in our marriage, my husband and I sat down to watch the Macy’s Thanksgiving Parade. Disappointingly, we discovered the cable was out. Hours later when it was time to watch football, the cable had still not been restored. After our guests left, I called the cable company only to learn it had been turned off due to a failure of payment. The unopened VERY RED bill was at the bottom of a mountain of mail upon my desk. Here is the beauty of who I am. I am exactly who I am meant to be. While paying bills and cleaning house are not my strong suit; being creative, making people laugh, and bringing people together are. Instead of spending energy trying to overcome my shortcomings, I surround myself with people who balance my shortcomings and I spend time fostering my strengths instead. God does not make mistakes. I therefore am not a mistake. We are part of an interdependent race, if I could do all things who would I need? In His infinite wisdom, the Creator of the Universe has made me complex and marvelous! Who am I to argue with God? Three different times I begged the Lord to take it away. Each time he said, “My grace is all you need. In his Second Letter to the Corinthians St Paul speaks of a ‘thorn’ that three times he begged the Lord to take and yet it remained. The Lord revealed to Paul this very thing he wanted removed is actually a gift that kept him reliant on God’s grace. This thorn – be it anxiety, illness, or perceived character flaws – continued to plague Paul, not to torture him, but to keep from not forgetting he needed God. 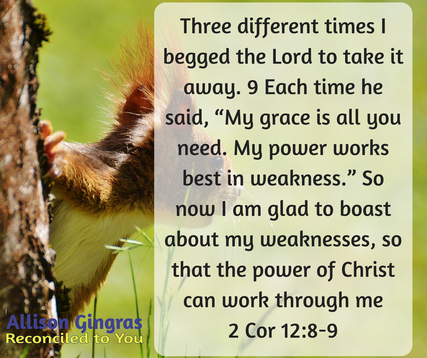 This weakness turns out to be his greatest strength. 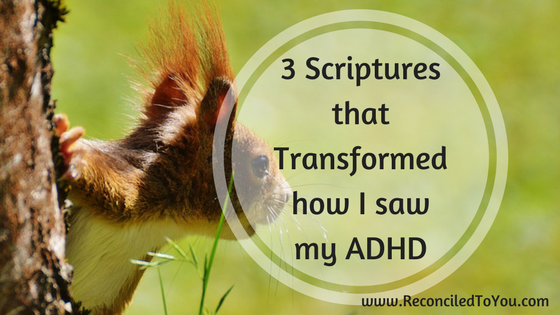 How often I have begged God to remove the symptoms associated with my ADHD. In some ways, He has answered this prayer by allowing me to learn coping mechanisms for my struggles with social communication and executive functioning but in many other ways the thorn remains. My co-existing (or co-morbid) condition of anxiety helps me to learn to trust God in all circumstances. The mistakes and missteps caused by my lack of focus or impulsivity teaches me humility; and in most cases, helps to teach some else patience. My greatest weakness has become my greatest strength because it reminds me everyday I can do nothing apart from the grace of God! As the men watched, Jesus’ appearance was transformed so that his face shone like the sun, and his clothes became as white as light. Suddenly, Moses and Elijah appeared and began talking with Jesus. As soon I read this Scripture account of St. Peter with Jesus during the Transfiguration, I thought this is an ADHD moment if ever there was one! Peter is so excited by what he is witnessing, he immediately wants to respond to what he is feeling. I’d had been the same way. This is so cool, Jesus! If you want Lord, I can pitch some tents and we can stay here forever. He, unlike Our Blessed Mother, was not one to ponder what he was witnessing but was ready to go with the first thought that came into his mind. Heart in the right place definitely, but consider the whole situation to find the best course of action – not so much. The ADHD mind, well at least mind, is constantly floating new and exciting ideas in it. Every experience appears an to hold an opportunity ready to be turned into something bigger or better. My notebooks filled with ways I want to share the faith, be a better mother, lose weight, and pinch pennies. Most of these jotted down with great excitement on the heels of an amazing experience, aware few of those ideas will ever see the light of day. How often, like Peter, I have blurted out the first thing that came to my mind when in stimulating or exciting situations, without spending any time considering the details. Understandably, they are not always received with the same excitement or enthusiasm, even causing embarrassing misunderstandings..
Like Peter, when I learn to properly direct my enthusiasm, I can do remarkable things for the Kingdom of God. The positive of ADHD is an abundance of creativity and energy to execute those ideas. And, I am clearly in very good company.